Ideally located just 50 miles off the coast of Florida and only a three-hour plane ride from the hustle and bustle of New York City, one of the biggest appeals of the Bahamas has always been how easy it is to get to no matter what time of year. And besides the chance to catch some rays on its pristine beaches and bask in panoramic splendor, today’s discerning global traveler now has another great reason to spend his or her downtime here: the SLS Baha Mar Hotel. 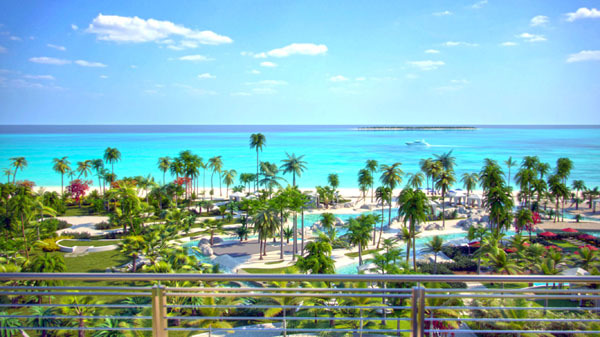 Opened this past November and bringing an entirely new level of sophistication to the Bahamas, this spectacular $4.2 billion beachfront destination in the heart of Nassau epitomizes high-end luxury resort vacationing at its finest. With other signature hotels currently open in Beverly Hills, South Beach, Brickell and Las Vegas, SLS Baha Mar’s newest location and first foray into the Bahamas has already been named one of Travel + Leisure magazine’s top picks of the best new hotels in the world. Ideally set upon 3,000 feet of sparkling white-sand beach and crystal-clear waters, the latest entry features 229 spacious guest rooms and suites with multiple floorplans overlooking the Atlantic Ocean that can comfortably accommodate two to six people depending on the size of the space. Suites have their own terraces. The largest—the 1,780-square-foot two-bedroom SLS Residence—also has two separate living room areas, each equipped with their own 55-inch HD TV. Regardless of which kind of accommodations you choose, you won’t be disappointed or want for anything when it comes to their individual amenities. Each room and suite is elegantly appointed with Bahamian-designed furniture and SLS signature bedding, along with wall-mounted HDTVs, a walk-in rainfall shower, full in-room WIFI connectivity, plus SLS-monogrammed slippers and robes, as well as a wide selection of custom soaps, shampoos, moisturizers and a fully stocked minibar. 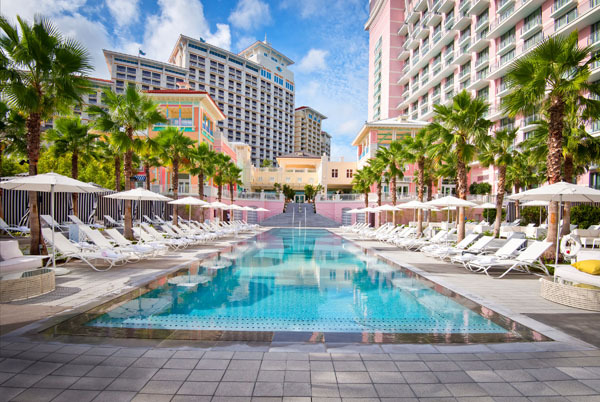 Of course, recreation is a major part of any Bahamas stay and the new SLS Bar Mar Hotel—which joins the Grand Hyatt and Rosewood as one of the area’s three major resorts with over 2,300 rooms now in total combined—offers all-ages fun for everyone from dawn to dusk. In addition to activities like local sightseeing, snorkeling, sailing and cycling, there’s also plenty to do without ever leaving the property. By day, for example, you can relax and drink signature cocktails at either the Bungalow Pool Bar & Grill that features a waterslide, or at the Privilege Pool where you can sit underneath private cabanas. In addition to drinks, both pools have offer a light food menu served by a private concierge. There is also tennis, a state-of-the-art fitness center and a lush, 72-par 18-hole golf course designed by none other than golf legend Jack Nicklaus himself, as well access to the finest luxury and fashion retailers in the world. Bvlgari, Rolex, John Bull and Tiffany & Co. are among just some of the stores here. And take a moment (or longer since most regimens are between 60 to 90 minutes) to pamper yourself at their spa, which is aptly called ESPA, and offers all sorts of signature exotic treatments from facials to massages and much more. 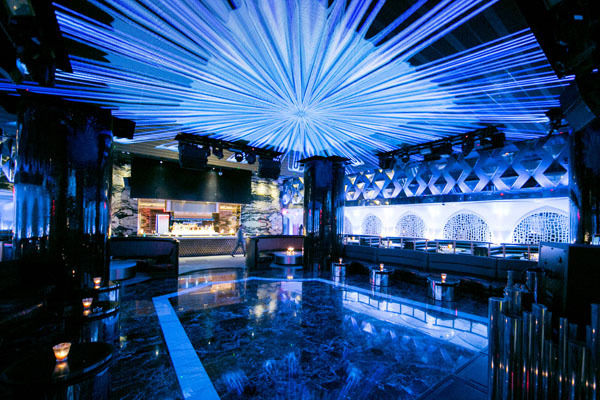 At night, the hotel has several bars and nightclubs to choose from, including its flagship Monkey Bar located in the main lobby. There is also Bond, a 10,000-square-foot venue with a state-of-the-art sound system and DJ booth for entertainment and dancing, as well as Skybar, an open-air, ivory-covered pavilion on top of the hotel that is currently being built. Pleasing the palate is another cornerstone of this oasis, which also features three stand-alone world-class restaurants—Katsuya by Starck (Japanese), Cleo Mediterráneo (Mediterranean) and Fi’lia by Michael Schwartz (Italian)—each one with its own award-winning chefs and menus, and providing a veritable feast for the senses. 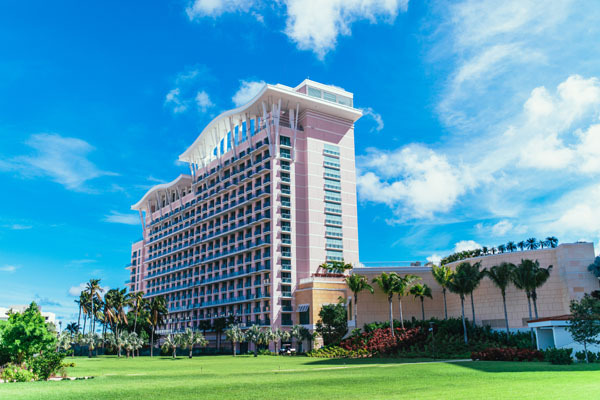 For kids age three to twelve, the Baha Mar Explorer’s Club Program offers daily morning and afternoon programs, including art classes, bird and nature excursions and marine biology classes with sting rays, sea turtles and nurse sharks. A $60 daily resort fee per room applies to all bookings and includes roundtrip airport transportation, as well as access to all amenities. For more information about accommodations and individual packages, visit www.bahmar.com.